It’s been ages since I last posted (and by the way, I did finish my script for Script Frenzy), but I haven’t been lazy. 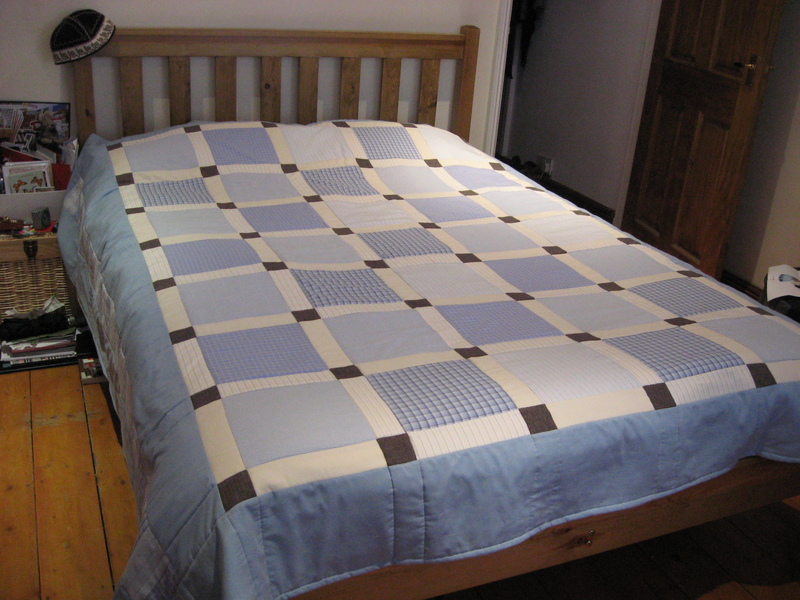 I’ve made several quilts in the last few months, one large and a few small. And now that I have joined the Committee of the London Quilters as their new Secretary, I better get cracking and show those quilts off! The first one is one I made for my brother-in-law to put in his new house, which he bought in February. Since I thoroughly enjoyed making my first quilt out of my husband’s old shirts, I decided to do the same for my brother-in-law and upcycle the shirts he didn’t use any more. 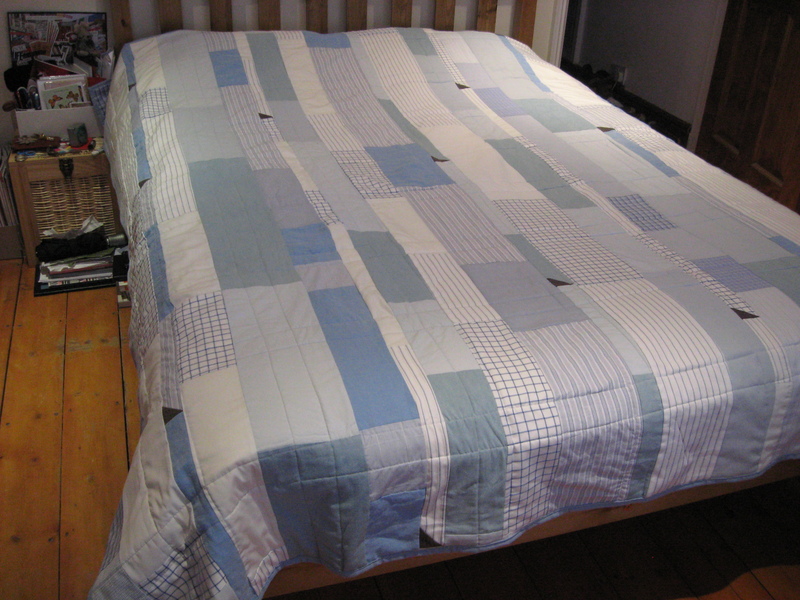 I asked my mother-in-law to secretly send me all of the old shirts he was about to send to the bin, and I cut them up and made a huge quilt out of them – with different designs on the top and the bottom. Luckily, he wears a lot of blue – so everything matched. The little bits of brown are from a pair of trousers (my husband’s, not my brother-in-law’s). I can’t say for certain that every single piece of fabric came from one of his shirts, but they were either worn by him or by his dad or my husband, so it’s all in the family. The quilt was made as a surprise and it certainly was. I was really pleased with the reaction from my brother-in-law – he really appreciated it. 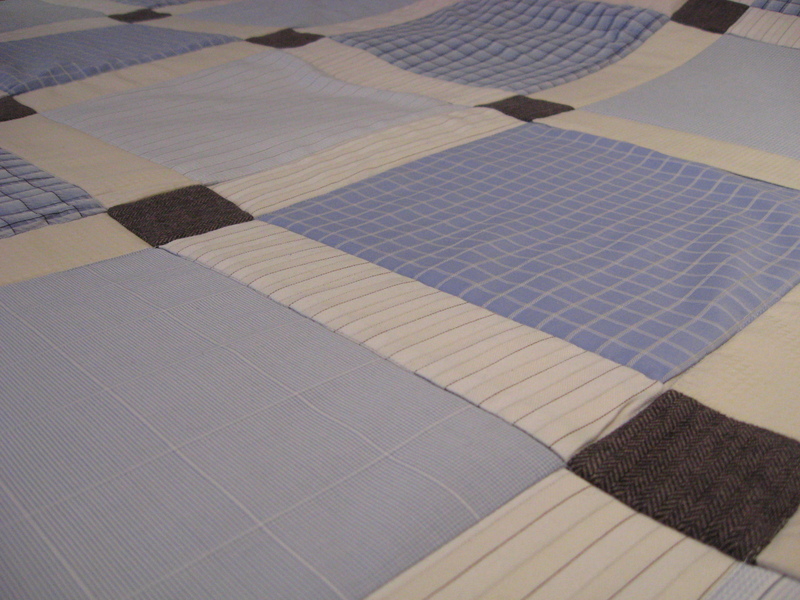 I was less pleased with the two days of neck pain that I had after frantically quilting for 9 hours the night before I gave the quilt to him. Our kitchen table was no match for the weight and bulk of a king-size quilt. I hadn’t realized how much of the weight I was managing with my neck and shoulders while putting the quilt through the machine. It sure took me out of action for a couple of days! Next time I make a quilt this big I’ll have to think about how to save my muscles and not overload them. It was worth it, though. Brother-in-law's quilt - front detail. Beautiful quilts. Sorry that your neck hurt after this, though. Wow that’s so much work!! I can’t believe you pieced both sides! Great job!